Wigs are ideal for a variety of situations. They can add volume and length when hair is thinning or has been lost. The American Hair Loss Association reports women make up 40 percent of hair loss sufferers. Wearing a wig can help women who are going through this, and it's less expensive and less invasive than pricey medical procedures to restore hair. Plus, you can change your hairstyle with each wig! Wigs are fun for anyone. They can transform an everyday look into something special. They allow you to get the exact hair style you want, without having to wait months or years to grow your hair. You can switch up your color without having to dye it or spend money at a salon. In just a few minutes, cheap, real-hair wigs can be applied and enjoyed. With 360-degree frontal lace wigs, lace underneath the real-human hair goes all the way around the perimeter of the wig. That makes these wigs great for those who want versatile hair styles, from pony tails to updos. To create a 360-degree frontal lace wig, hairs are applied manually. This provides a look of real strands growing out of the scalp, making these types of wigs one of the most natural-looking available. Also, the mesh material in the wig is breathable. You head won't feel itchy, and the wig remains cool when you're in hot temperatures. These types of wigs also provide the option of adding more bundles at the crown area by sewing them in, so you can make your wig as voluminous as you want. One of the reasons why AiryHair is one of the top good places to buy wigs online, though, is that our high-density options provide amazing volume as-is. Another unique element to 360-degree frontal lace wigs is that their circumference can be made smaller, in case the wig is too big. This isn't an option with other types of wigs. You can grab, wear and go with 360-degree frontal lace wigs, or opt for a more secure and stable application. To make sure the wig stays in place exactly how you want it to, you can sew the wig on, use glue or use tape. These types of wigs are ideal for those who want a realistic hairline and crave va-va-voom volume. As you'll see from the next two types, all AiryHair wigs are of exceptional quality and make AiryHair the answer to where to buy good wigs online. Lace front wigs have sheer lace at the front between temples, with hair strands hand-sewn into the lace. Lace front wigs come with combs attached to the cap, which enable the wearer to easily secure the wig. Lace front wigs are one of the easiest types of wigs to apply and are perfect for beginner wig wearers. Because of the way lace front wigs are constructed, the wearer will usually have to wear the wig with the hair parting that is designed in it – for example, a center part. Also, because the lace is only at the front of the wig, wearing hair down or in a low ponytail is recommended, because updos can reveal a hairline. Application methods are similar to 360-degree frontal lace wigs. Because of the built-in combs, lace front wigs give extra security if you're not using tape, glue or a sew-in method. However, these latter methods offer the most stable application. Like all wigs from AiryHair, lace front wigs can last in perfect condition for around up to a year with the proper care. Regular brushing is key to prevent tangles. Only wash AiryHair wigs with natural hair care products, and use a leave-in conditioner to keep strands extra-soft. Proper storage of a wig away from sunlight in a cool, dry place helps increase its longevity. A wig stand is a great tool to have for storage. Full lace wigs have caps that are completely made out of lace, with a band around the cap that stretches. Hairs are manually attached to the lace. You can part your hair however you want with full lace wigs, because the cap has lace throughout it. You can also style your hair any way you want, including in a high ponytail. 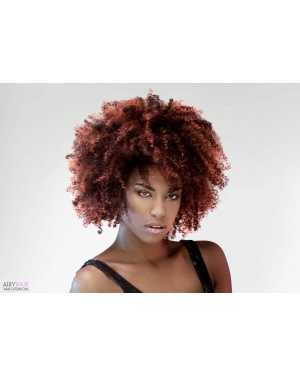 Application for full lace wigs can be instant. You can wear a wig cap, and then put the full lace wig on top of it. For more security, you can sew the wig on or use glue. Full lace wigs offer a more natural look than higher-density 360-frontal lace wigs or lace front wigs, because adding extra bundles is not an option with these wigs. If you want a seamless look that is just about identical to a natural hair-covered head, full lace wigs reign supreme. The impeccable craftsmanship makes these one of the highest-quality wigs available. At AiryHair, we love helping people achieve any type of hairstyle they want, with amazingly beautiful real-human hair that is a dream to touch and wear. AiryHair wigs are great for a variety of needs and occasions. We know you'll love wearing them, and you won't even remember they're not your actual hair! Shop our diverse wig types now.